Private security firms, despotic regimes and the rest of the military industrial complex will converge on the Excel Centre in London this week, for the DSEI (Defence Systems and Equipment International) Arms Fair. This meeting is like Market Day for the warmongers of the world, and the taxpayer is picking up the bill. The UK is one the world’s leading arms exporters. 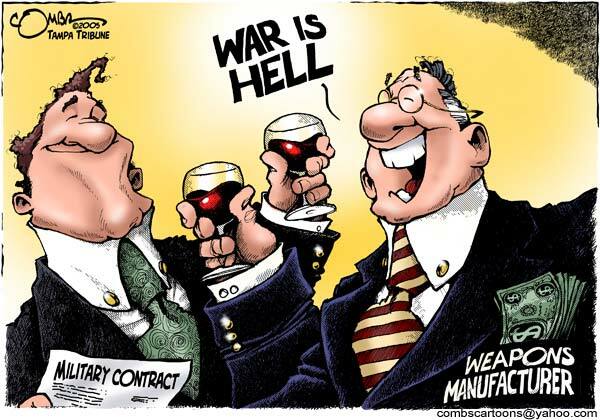 The UK arms industry employs 100,000 people and turns over around £22bn a year, £8.8bn of that in exports. The UK manages its arms exports through the UK Trade and Investment Defence & Security Organisation (UKTI DSO) – a government body, staffed by 160 civil servants. The UKTI DSO is head cheerleader and facilitator on behalf of the UK arms industry – with offices across Africa, Europe, the Middle East, Central and South East Asia. 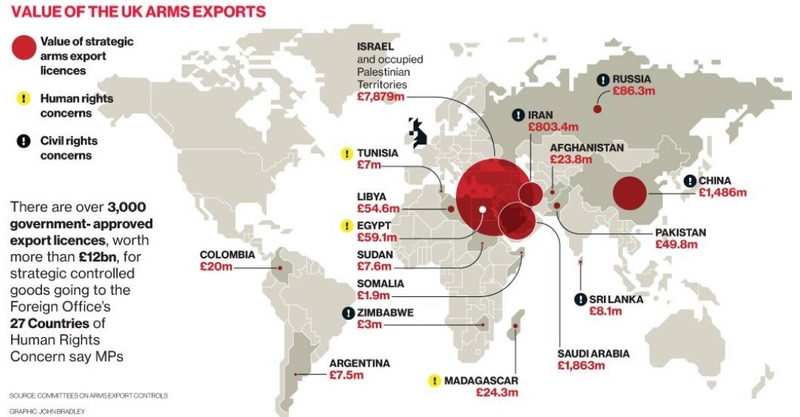 The Coalition Government of the UK has issued 3000 export licenses, amounting to £12.3bn, to repressive states such as Saudi Arabia, Israel, China, Sudan, Somalia and Zimbabwe. A July 2013 report by the parliamentary Committee on Arms Export Controls found there had been 62 licenses granted to sell military equipment to Iran. There were 271 licenses granted to sell biotechnology equipment, sniper rifles, laser weapons systems, weapon sights and drones to Russia. Both states are known to be arming and equipping the Assad regime in Syria. Not content with arming Syria indirectly, the UK government has also been arming them with the ingredients for chemical weapons directly. While the government appears on the world stage, condemning the uses of chemical weapons by Syria, it has been simultaneously supporting the sale of such weapons to states across the globe, including Syria. The world spend $1trn on the arms industry every year. 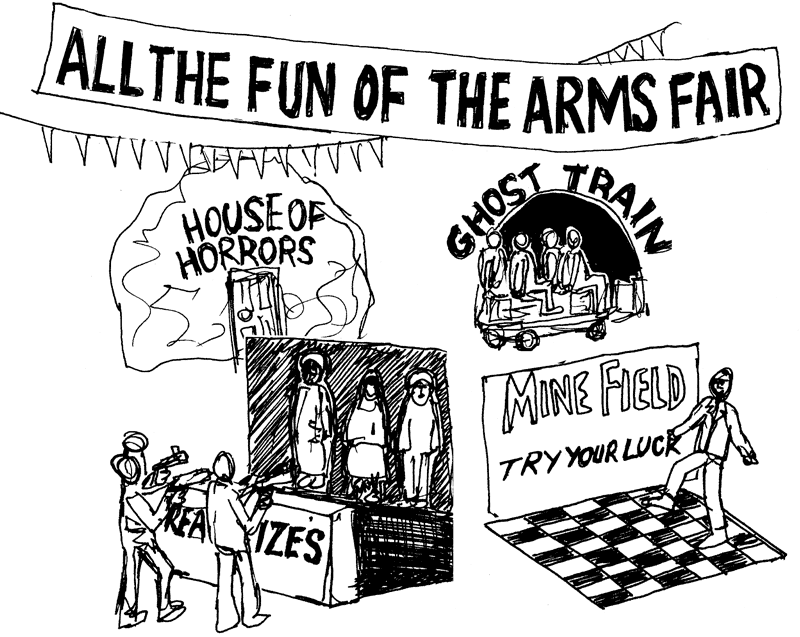 Every two years, Clarion Events manages the DSEI Arms Fair in London, to profit from despotic regimes tooling themselves up to the teeth. The DSEI hosts 1,400 international weapons companies, and nearly 30,000 buyers and sellers attend the event. The UKTI DSO ensures the biggest names attend and the event maintains its prestige by issuing invites and providing travel, accommodation and hospitality to known human right abusers and war criminals. In previous years, the invite list for such red carpet treatment has been extended to Bahrain, Iraq, Oman, Saudi Arabia, The United Arab Emirates, Colombia, Nigeria, Peru, India, Pakistan, Libya and Burma – none of which can be considered paragons of virtue with regard to upholding human rights. The bills for this hosting these nations runs into the hundreds of thousands of pounds each event, while the Ministry of Defence spends significant sums on showboating – providing Royal Navy Ships, personnel and other equipment to sell the image of the UK’s military might. On top of these costs, the Metropolitan Police are required to police the event, becoming publicly funded private security for the arms industry for the duration. Bills in previous years have hit £4m. Inside the event, the unethical arms industry carries on regardless, facilitating the killing and torture of civilians around the world. While the event is closed to the public, MPs are allowed access. In 2011, Green MP Caroline Lucas attended the event only to find a stand from Pakistan promoting the sale of Cluster Bombs; these weapons, which release smaller bombs on detonation over a wide area, were outlawed by the Convention on Cluster Munitions in 2008 for their dangers to civilian populations. The bombs are deadly long after wars end. Each year more than 300 people die after contact with unexploded cluster bombs dropped during the Vietnam War more than 40 years ago. Comedian and activist Mark Thomas gained entry to the DSEI Arms Fair in 2005 and found leg irons, stun batons and stun batons available for sale – all in contravention of the UK’s Export Control Act 2002, 2003 and 2004. Be in no doubt. The police are securing, and the UK government is funding, the sale of illegal and conventional weapons to repressive regimes and mercenary forces. 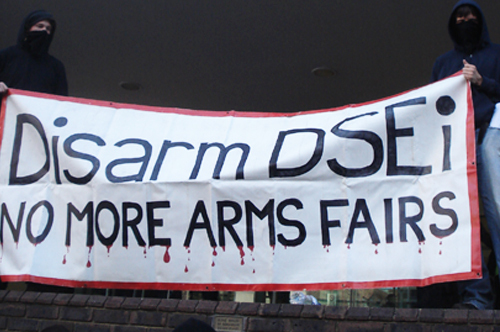 This is the purpose of the DSEI Arms Fair – and the taxpayer is footing the bill. Providing a well-timed statement ahead of the event, Prime Minister David Cameron today announced £160bn public expenditure on arms and equipment over 10 years in the Defence Growth Partnership. Occupy London, in coordination with Stop the War Coalition, are mounting protests and awareness raising around the arms this year. They have kicked off in fine fettle with a series of lock ons, die ins and occupations springing up around the gates to provide arriving delegates with a more suitable welcome. Green Party Leader Natalie Bennett addressed protesters on their first day of action on Sunday 8th September 2013., and a delegation from Bahrain also addressed crowds, giving first hand testimony of the brutality meted out on them by the very weapons being sold inside the Arms Fair. NO to the unethical arms industry that seeks to profit from death and devastation of people and planet. NO to the abuse of public funds, diverted from the public good to the private profit of the arms industry. NO to tax payer funded police officers being reallocated to private security for this illicit event. NO to the UK government acting as the pimp of the arms industry. This excellent account and collection of photographs of protests so far tells the story of how campaign groups for economic, social and environmental justice have once again united to stand against egregious profiteering on the back of public pain. They were joined by Christian groups, activists, citizen journalists and a new wave of first time protesters. It is no longer enough to shake our heads at the hypocrisy, corruption and human suffering reaped by the arms industry and their funders in our government. If we want the fair and the industry to end, we have to bring it to an end. It is time to get involved. The Occupy London Facebook Page and Twitter Account will keep you up to date on news and events from the protests. DID YOU FIND THE ARTICLE USEFUL? PLEASE LEAVE SOME COINS IN THE VIRTUAL TIP JAR! WTF!!! I am lost for words.